Nora Gonzalez, right, is unable to work as a caregiver because of criminal justice debt she has been unable to pay since being convicted of passing a bad check in 2005. 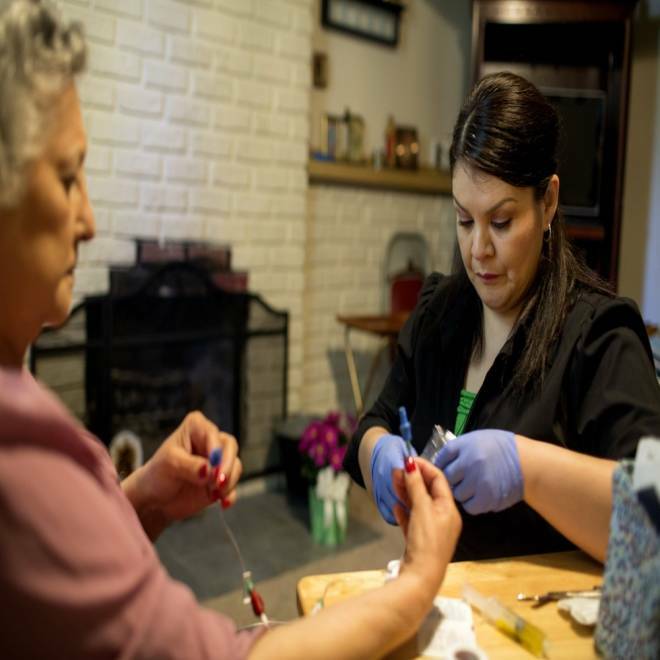 Here, she assists Cleo Nimietz, her boyfriend's mother, who suffers from sarcoma, in the latter's Federal Way, Wash., home. Cash-strapped cities and states increasingly are trying to tap a previously overlooked pot of money – uncollected fines, fees and other costs imposed by civil and criminal courts – in order to help them balance their books. And when people don’t pay these court-ordered debts, some local officials have not been shy about tossing them in jail, leading to the creation of modern-day “debtor’s prisons” full of poor offenders, advocates say. While there is no comprehensive data on how many states jail citizens for court-related debt, several organizations, including the Brennan Center, have raised alarms over what they say is the widespread practice of locking up poor offenders in violation of federal law, citing Supreme Court rulings that someone can only be incarcerated for “willfully” refusing to pay. James Robert Nason could be a case study for the court-debt-prison cycle. In 1999, when he was 18, he pleaded guilty to second-degree burglary in Spokane, Wash. He was sentenced to 30 days in jail, community service, and ordered to pay $735 in court costs, attorney fees and restitution. That debt began to accrue 12 percent annual interest from the day of his sentencing. Nason didn’t finish the community service, and didn’t keep up with the payments. As a result he served more than 120 days behind bars over several years, despite arguing that he couldn’t afford to pay. At one hearing, he said he was both homeless and unemployed. In 2006, as he faced 120 more days in jail, his court-appointed appellate lawyer argued that Spokane’s self-described “auto jail,” which put Nason behind bars without a hearing whenever he failed to pay, violated his rights to due process. In 2010, the Washington State Supreme Court agreed. Before imposing sanctions for failure to pay court debt, “a trial court must inquire into the offender’s ability to pay,” the court wrote in its decision in Nason’s case. Spokane court officials declined to comment, citing pending lawsuits. Certain counties in Florida, Ohio, Georgia and elsewhere also routinely imprison people who fail to keep up with court debt, according to the American Civil Liberties Union and the Brennan Center. In practice, advocates said, courts often fail to inquire about a defendant’s ability to pay until after they’re incarcerated. Trying to collectEven states that do not regularly jail debtors may use the threat of jail to go after fees and fines -- with consequences that can play out for years. 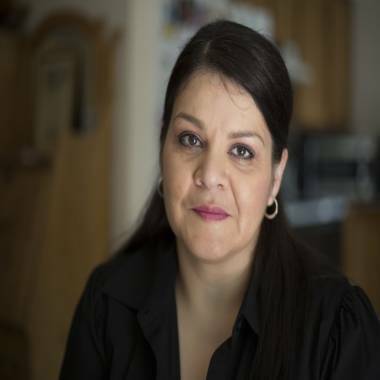 Nora Gonzalez must pay about $3,000 in outstanding fines, fees and interest payments, then wait five years before she can have her record expunged and become re-licensed in her former occupation as a caregiver. Nora Gonzalez, a 40-year-old Seattle resident, discovered how persistent court-ordered debt can be after she was convicted in 2005 of passing a bad check. She served a few days in jail at the time and was sentenced to make payments to the court. Last year, she found she owed more than $3,000 in restitution, which has now gone to collections. She must pay her outstanding fines and fees, then wait five years, before she can have her record expunged and become re-licensed in her former occupation as a caregiver. Without a job, she struggles to pay it. But until she pays it, she cannot work. In what critics see as an example of collection efforts run amok, Philadelphia in 2010 began to collect court-related debt dating to 1971, after a series in the Philadelphia Inquirer revealed the city had failed to collect an estimated $1.5 billion. A review by the courts determined that an estimated 400,000 residents owed the city money – cash that Philadelphia, facing a $1.35 billion budget shortfall over five years, sorely needs. First Judicial District President Judge Pamela Dembe defended the program, which critics say has been problematic because of often incomplete payment information, making it difficult --and in some cases impossible -- to prove whether the debt has been paid. Critics argue that that debt and aggressive collection efforts can prevent poor defendants, many of whom lack legal representation, from contributing to society. “We’re talking about saddling a population that has nothing with debt, and then telling them they’re supposed to successfully re-enter society and be productive,” said Rebecca Vallas, an attorney with Community Legal Services, which provides legal assistance to poor Philadelphia residents. 'Stunted my growth'Tyeisha Gamble, 26, who lives on Philadelphia’s north side with her 2-year-old son and her boyfriend, said she has been trying to extricate herself from the system for seven years. In 2006 she was convicted of simple assault, a misdemeanor, after an altercation with a co-worker. Included in her criminal conviction -- her first and only -- were about $500 in court-ordered fees and fines. She said she did her best to pay her debt while attending school, racking up more debt with student loans, but fell behind. In 2011, she earned her BA in fashion marketing from the Philadelphia Institute of Art. But Gamble said her criminal record, which can’t be expunged unless she pays her debt, has made it nearly impossible to land a job in her field. Compounding the problem, in Pennsylvania, as in most states, criminal justice debt can also lead to civil penalties, including suspension of drivers’ licenses, garnishment of wages and loss of public benefits. Sanctions like jail or suspended licenses do not always bring money in, however, so some courts are looking to private companies to help. States such as California and New Jersey have passed laws that allow private vendors to help bring in outstanding fines. In these instances, courts and municipalities contract with traditional debt-collection agencies, often the same firms that collect on credit card or health care debt. The companies, in turn, often tack additional one-time or monthly service fees onto debtors’ bills. Other companies have moved beyond collections work to become a part of the criminal justice system itself by overseeing probation. Over the past 15 years, these for-profit probation companies have emerged as important players in court systems across the country, particularly in the South. Judicial Correction Services, a probation company operating widely in Georgia, Alabama and Florida, has placed advertisements in publications geared at municipalities promising increased revenue, streamlined court dockets and reduced expense. “Unpaid ﬁnes are nearly eliminated,” the ad promises. The role of private companies in enforcing court-ordered financial penalties has led to legal challenges in Alabama, Georgia and Washington, among others. The suits allege that the companies, which charge monthly supervision fees and additional fees for monitoring, drug testing and other services on top of court fees and fines, routinely seek to incarcerate offenders who fall behind on their payments. In a ruling last summer on a suit involving Judicial Correction Services, an Alabama judge said that the probation system in one town had led to a “debtor’s prison.” The company said it was merely complying with a state mandate to collect on court-ordered fines and fees. Judicial Corrections Services did not respond to requests from NBC News for comment. Those skeptical of the for-profit model worry that private companies are more focused on the bottom line than the public good. Dale Allen, chief probation officer for Athens County, Ga., said that although the county’s publicly run probation program charges monthly supervision fees, probation officers there are less focused on collecting fees than a for-profit company may be. The reporting for this story was supported in part through a grant from the nonprofit Open Society Institute, which says its mission is to "build vibrant and tolerant democracies whose governments are accountable to their citizens."